In April 2018, the Downtown Hilo Multimodal Master Plan was approved and signed by Mayor Harry Kim, Director of Public Works Allan G. Simeon, P.E., and Planning Director Michael Yee. The Downtown Hilo Multimodal Master Plan can be found online (link below) or reference copies are available for review at the Hilo Planning Department. On February 15th, 2017, Community Meeting #2 was held for the Downtown Multimodal Master Plan. Nearly 60 community members attended the meeting to learn about the the public review draft, and provide feedback. To view a summary of the meeting, including the community’s feedback and the meeting’s presentation, click here. The County of Hawai‘i Planning Department announces the release of the Downtown Hilo Multimodal Master Plan (DHMMP) Public Review Draft and the kickoff of the public review period, which runs through March 6, 2017. Written comments may be sent by e-mail to downtownhilo@hawaiicounty.gov, or by mail to the County of Hawaiʻi Planning Department at 101 Pauahi Street, Suite 3, Hilo, Hawaiʻi 96720. A community meeting is planned for February 15, 2017 from 4:30 pm to 7:30 pm at the Mokupāpapa Discovery Center in Downtown Hilo, 76 Kamehameha Avenue. The event will include open house displays and a presentation on the DHMMP Draft at 5:00 pm. Discussion and input are encouraged. The Downtown Hilo Multimodal Master Plan (DHMMP) has its roots in EnVision Downtown Hilo 2025: A Community-Based Vision and Living Action Plan, which set a community-defined and shared vision for Downtown Hilo as a vibrant, sustainable, safe, healthy, and active community. Action item number 6.1 of the EnVision 2025 Plan is: “development of a master plan to include traffic circulation, parking, and pedestrian streetscape.” The County of Hawai'i Planning Department initiated the DHMMP to fulfill this action item and craft a plan that can be implemented to achieve the community’s shared goals. The Downtown Hilo Multimodal Master Plan was developed over a two-year period and refined through more than 15 community events, from focus groups with Downtown users, landowners, and businesses to a community event that included activities and demonstrations of complete streets concepts. Input indicated strong support for making Downtown Hilo more walkable, bike friendly, and vibrant for people of all ages and abilities. Ensure improvements preserve and enhance Downtown Hilo’s character and charm and make it more inviting and safe. Alternatives and final recommendations for six multimodal transportation components were developed and refined with extensive input from the community and key stakeholders: 1) circulation patterns; 2) pedestrian improvements; 3) bicycle facilities; 4) parking; 5) transit; and 6) streetscape design. The DHMMP includes phasing recommendations for implementing the proposed improvements. The third and final Zoom In Zoom Out session for the Downtown Hilo Multimodal Master Plan was held on August 28. Once again it was an excellent turnout, and we thank all of you who came out to share your mana’o. Determining streets that could be used as Festival Streets, Shared Streets, Complete Streets and/or two way conversions. Determining appropriate additions to the trail network. Locating placement of bike facilities including bike shares and bike corrals. Discussion on placement of curb extensions and parklets. Discussion of desired pedestrian features including expansion of covered walkways and a pedestrian bridge. Determining ADA needs to be implemented in street design infrastructure. Determining if green streets and street trees would be good for Hilo. Notes - The notes describe discussion on individual topics and document verbal and written comments received from attendees. Handouts - The handouts show proposals under consideration. As always, we welcome comments during the process. They can be sent via e-mail to downtownhilo@hawaiicounty.gov. Over the next couple of months, we’ll be preparing an initial draft of the Downtown Hilo Multimodal Master Plan. Once available, it will be made available for public review and comment, and we’ll have another community event. If you haven’t already, make sure you’re on our mailing list to receive news about the Draft Plan. Sign-up is through the website. The second of three Zoom In Zoom Out session for the Downtown Hilo Multimodal Master Plan was held on August 14, and it was a large and lively crowd! Presentation and discussions focused on Parking and Transit for Downtown Hilo. Here are the materials you need to brush up on what happened – comments are always welcomed! Notes describe topics and record comments received from attendees. Handouts show proposals under consideration. We hope to see you at ZIZO 3 THIS FRIDAY August 28 for more discussion! This third and final ZIZO will focus on Pedestrian Improvements and Street Design. We need YOU to come and share your mana’o. Once again, we’ll be meeting from 2:00-5:00 PM at the Aupuni Center Conference Room, 101 Pauahi Street in Hilo. Connecting Downtown to the Bayfront Trails Master Plan and regional bikeway network and more! We hope to see you at ZIZO 2 (August 14) and ZIZO 3 (August 28) for more discussion! Check the project website for details. YOUR participation is wanted at the second ZOOM IN/ZOOM OUT session for Downtown Hilo! The County of Hawaii’s Downtown Hilo Multimodal Master Plan (DHMMP) kicked off Saturday May 2, 2015 with a festive community event that spanned two venues and a street festival. More than 100 community members attended technical presentations and talk story sessions at Mokupāpapa Discovery Center and toured an open house at Yamada Technologies. Presentations focused on topics that affect mobility and accessibility in Downtown Hilo, such as parking, crosswalks, bicycle issues, and connections to the Bayfront. Community input was gathered through written comments, discussion, and annotations on maps and concept drawings. The street festival included a keiki bike rodeo by PATH (Peoples Advocacy for Trails Hawaiʻi), a bike giveaway by Hilo Bike Hub, a street yoga class by Yoga Centered, a historic walking tour of Downtown Hilo by Lyman Museum, food by Kona Dogs, a book giveaway by Hilo Public Library, a bicycle tour by the Mayor’s Active Living Advisory Council, and a parklet demonstration sponsored by KTA and Garden Exchange. As a follow-on to the community kickoff event, the DHMMP project team, led by SSFM International, will host a series of “Zoom In Zoom Out” working sessions during the summer of 2015. Each three-hour session will be open to the public and will “zoom in” on solutions for a particular area of Downtown Hilo, such as Kino’ole and Keawe Street, or Kamehameha Avenue and Bayfront Highway. Each session will also “zoom out” to examine how proposed changes to a particular area could affect downtown and surrounding areas as a whole. Dates and details for the sessions will be posted on the project website, www.hawaiicountycompletestreets.com. 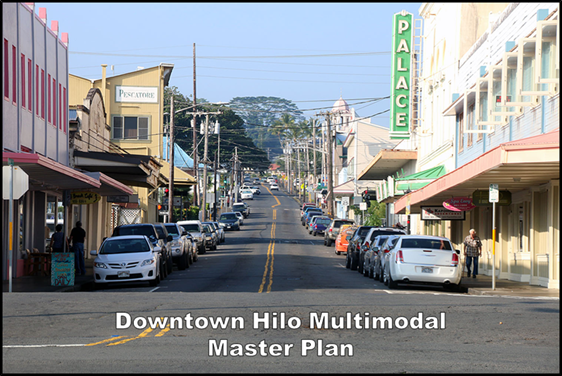 Input from the community meeting and Zoom In Zoom Out sessions will inform the Draft Downtown Hilo Multimodal Master Plan, which is anticipated to be unveiled later this year. The Downtown Hilo Multimodal Master Plan (DHMMP) celebrates its public kickoff on Saturday, May 2nd, from 8:30 am to 4:00 pm. The event is FREE and all are welcome to come and participate in a wide range of activities designed to educate, collect input, and engage all ages in helping to create a more walkable, bikeable, livable Downtown Hilo! Pick up the full program and topic list at the information tent in front of Mokupāpapa Discovery Center (76 Kamehameha Ave). Check out ideas for transit, parking, bike lanes, signage, sidewalks, and more at the open house! Share your comments and ideas through written comments or sketches on our white board tables. Keiki Bike Rodeo by PATH for Ages 9-11: Peoples Advocacy for Trails Hawai‘i (PATH) sponsors this fun event for 4th and 5th Pre-registration is required, and participants receive FREE bike helmets! Contact Chris Seymour or visit Hilo Bike Hub to register: 808-961-4452). Loaner bikes are available, or bring your own! Historical Walking Tours of Downtown Hilo: Meet in front of Mokupāpapa Discovery Center at 1:00 pm for an hour-long jaunt through downtown Hilo guided by Lyman Museum historical experts Susan and Rob McGovern. Space is limited and it’s first come, first served. Bring water, sunscreen, walking shoes, and umbrellas if rainy. Street Yoga by Yoga Centered: Molly Masaoka of Yoga Centered leads a free, all-levels yoga class right on Kamehameha Avenue from 1-1:45 pm. Wear loose fitting clothing and bring water, sunscreen, and a yoga mat if you have one. If not, loaners will be available. No need pre-register, just show up ready to stretch! Hilo Public Library Pop-up: Hilo Public Library hits the streets! Stop by their station to peruse magazines and books, create a DIY bookmark, and learn about the library’s programs. Parklet Demonstration:See what happens when parking spaces become mini-parks for people to sit, play, eat, and talk story. Come take a breather at our parklet pop-up on Kamehameha Ave. Downtown Hilo Bike Tour: Grab your bike and helmet and join Chris Seymour of the Mayor’s Active Living Advisory Council and Hilo Bike Hub for a discussion on bike facilities and safety and a two-wheeled spin around downtown. Meet at the parklet pop-up at 1:30 pm; tour will be pau by 2:15 pm. Helmets are required, and this ride is for ages 18 and over. Participants are required to follow all applicable traffic laws and follow recommended safety practices. Hilo Bike Hub Giveaway: One lucky attendee will win a 20″ kids bicycle or receive a $200 gift certificate to Hilo Bike Hub! Check in at the information tent in front of Mokupāpapa for details and to enter. Like big picture thinking? This is the must-attend session of the day, where the concepts, ideas, and technical experts come together for a discussion on how collective improvements can effect transformative change and help realize actions of EnVision Downtown Hilo 2025. Come, listen, and share your thoughts! The County of Hawai'i Planning Department initiated the DHMMP to fulfill this action item and craft a plan that can be implemented to achieve the community’s shared goals. The technical team for the project is led by SSFM International, Inc.